After the heavy bombing of Japan during World War Two only six Tosakin goldfish had survived. Jeremy Gay finds out more. Few people will have heard of the Tosakin and, to date, very few people keep and breed them in the UK. 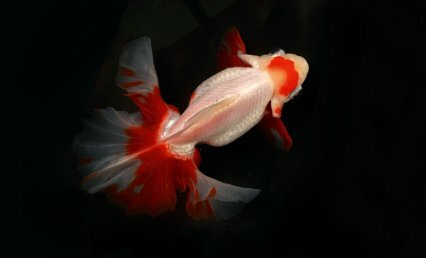 Originating in Kochi, Japan, this fancy goldfish is characterised by its very flamboyant undivided tail which, when viewed from above, fans out and even curls, stretching from gill to gill. As to its origins, although ornamental goldfish keeping originated in China, it quickly spread to Japan where certain varieties became synonymous with certain areas, like the Ryukin from the Ryuku Islands and the Ranchu from Tokyo, formerly known as Edo. The Tosakin was first recorded in 1845 in the Kochi Prefecture (formerly known as Tosa) and became established in the Meiji period dating from 1868 to 1912. However, the Tosakin was very nearly lost for ever after a string of events in the mid-1900s. An earthquake and Tsunami in 1946 followed heavy World War Two bombing of the Kochi Prefecture, leading to some people thinking that the Tosakin had become extinct. Then Mr. Hiroe Tamura, a Japanese hobbyist who had lost all his fish in the bombing, found six. He discovered them in a restaurant of all places and managed to trade a bottle of sweet potato vodka for them. With the country on its knees, cash had become worthless and a bottle of vodka would prove far more valuable to a restaurant trying to revive its fortunes. Among the six restaurant fish were two breeder fish and four two-year-olds, which then went on to fix the strain once more. This led to the Japanese government declaring them a natural treasure of the Kochi Prefecture. Wouldn’t it be nice if Bristol shubunkins were declared a natural treasure of Bristol? 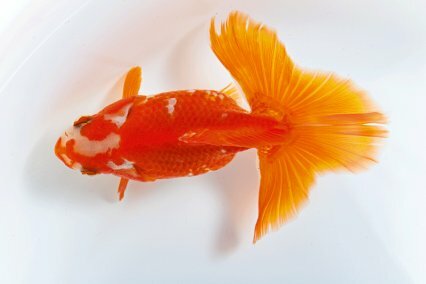 The Tosakin is now also known as the Peacock tail, Curly tail or the Queen of goldfish by the Japanese, with the Ranchu being the King. All of the world’s living Tosakin are now thought to have descended from those six tough restaurant survivors! The Tosakin is bred to be viewed from above, and doesn’t look very pretty or graceful, when viewed side-on in the normal way it would be viewed in an aquarium. This variety has a full dorsal fin, and all other fins are intact too, apart from the major characteristic of that tail, which has been described as a triple lobe or a cherry blossom tail. The inner edges are webbed and the outer lobes upturned and twisted towards the head, making the tail look as if it has been turned inside out. One book on Japanese goldfish claims that that the Tosakin was originally formed by crossing a Ryukin and an Osaka ranchu — another very rare, almost extinct breed that is kept going by as few as five people in Japan. As for keeping Tosakin, the traditional way that these fish are kept in Japan may seem very unconventional to us in the UK. They are kept in bowls (no change there then!) yet these bowls aren’t made from glass and sit inside the house. Instead they are shallow, earthenware and designed to be placed outside, with the fish viewable from above. This traditional type of bowl even pre-dates glass and is reminiscent of the first ornamental fish ever kept by humans! Traditionally these bowls aren’t filtered either, relying solely on frequent water changes to manage water quality and sometimes including floating plants like Water hyacinth or a water lily. One Japanese Tosakin website has referred to them as the "water lily bowl Tosakin." The shallow bowls are traditionally 60cm/24" wide and 18cm/8" deep with sloping sides, holding just a few fish depending on their age and size. After their first spring and autumn in these bowls the fish are moved to larger, rectangular containers. Because of that unique tail, Tosakin are poor swimmers and should only be kept with each other to avoid being out-competed for food or chased around endlessly in times of spawning frenzy. The traditional style bowls are said by many to be essential for the development of the tail, yet a quick Google search will reveal many Tosakin keepers across the world using modern plastic bowls, larger, rectangular plastic tubs or, in the case of expert Andrew Barton, featured below, shallow glass tanks. The bowl methodology may seem a bit cruel and out of date to most and anecdotal evidence suggests that the idea is for the fish’s body not to grow too quickly, while the tail continues to grow and develop. To develop it traditionally would mean to restrict movement and activity somewhat, as a Tosakin racing round a large pond may not develop that tail. Yet it prevents long bursts of active, linear swimming anyway, so this may not particularly matter. However, water depth is a common factor with all Tosakin keepers, with 20cm/7.8” or less the unwritten rule. As fancy goldfish go Tosakin are very buoyant, so even if you ignored all the advice from fancy goldfish keepers on the need for shallow water to develop body and head shape and placed them in deeper water, they would remain near the surface. Because they are so rare here you won’t find them without searching round. Andrew knows of just six Tosakin keepers in the UK and estimates just a handful of fish in the whole of the UK. However Stan Woolridge bought 16 from Andy Green of Star Fisheries and Andy then had four from Stan. The fish were for sale at £300 each when we visited in 2008 (the top picture shows them as they were then, and the bottom picture two years on). So do the maths — and no I won’t reveal where Stan or Andy live! These were juveniles too, so a quality adult fish may be worth much more. If you want to track down fish of genuine Japanese origins you will need to join one of the UK’s specialist goldfish societies. Several features of the Tosakin are meant to form imaginary circles. In a mature fish the tail will spread out as wide horizontally as the fish is long, so in theory, with a circle drawn around the fish when viewed from above the nose, end, left and right tips of the fishes’ tail will touch the circumference of the imaginary circle. Furthermore the trailing parts of the tail should form a semi circle, and the folded parts of the tail edges which stretch up right along the fish’s flanks should also be able to form those imaginary semi-circles. These ilustrations show what a good Tosakin should look like. Note that circles should only be possible when viewing mature fish with fully-grown tails and will not be possible to observe while raising any young. Maximum size: Tosakin seem to get to a maximum body size of less than 15cm/6”, though so few are kept in the UK that they may well grow larger than this and we just haven’t seen any yet. Preferred water parameters: pH 7-8.5, 15-30°C/59-86°F. Pond size required: Although the traditional methods dictate that 60cm/24” diameter shallow bowl, PFK always recommends a tank at least six times the length of an adult fish for long term care, so we recommend one of 90cm/36”. A black plastic water feature tub like the ones from Rolf C. Hagen would be good. They are long and wide, yet shallow and durable. Filtration: The Japanese don’t use any filtration, but we recommend an air powered sponge filter to provide oxygen and biological filtration, yet with little current in the water. Aeration: On top of filtration you will also need additional aeration via an air pump and air stone, and maybe even a heater. Extras: You’ll also need a dechlorinator to make tapwater safe, a good brand of dry food for fancy goldfish and some decent frozen bloodworm. In your medicine cabinet, arm yourself with a test kit, medications like anti fungal treatments, and some salt, to be administered if necessary. Red, red-and-white, iron black and more recently, calico are the easily recognisable colours. Those Tosakin with silver-white or yellow on their tails are designated national treasures. Fancy goldfish are prone to many health problems, because of their very unconventional shape. They can also have line breeding related problems, which should be bred out. Even the Japanese experts regard the Tosakin as a weak fish due the intensive in-breeding programme that had to be put in place in an effort to resurrect and revive the breed from those six wartime survivors. Tail curling (above) is definitely a Tosakin-only problem, and was noted by Andrew Barton in some of his early fish. Basically the tail fin becomes so developed that it protrudes all the way along the body and can actually stick in the gill when the fish is at rest. A skilled Tosakin breeder may note those most likely to develop this condition early on and cull them. Exactly as it sounds, gill curl (above) means that the gill plates curl outwards from the head, sometimes making the red gill filaments visible. It’s not life threatening, but unsightly. This can happen to lots of fancies, with Tosakin more prone than most. Also scored as "deportment" when showing fish, a fish should be able to hold itself upright in midwater while at rest and not float tail-up with its head down. Curl control: fact or fiction? To keep tail curl correct as it develops, it is said that a Tosakin should be kept in a round container. The water 'waves' bounce back in ways that encourage the tails to take on that characteristic shape. When in too deep a container, or one that’s rectangular, or a pond, the tail is said to flatten and develop mis-shapen bends and curls. Is a Tosakin the fish for you? When fish rarity and large sums of money are mentioned, that may be enough for some people to want to get involved and keep and breed them. Tosakin are one of the most extreme forms of fancy goldfish however, being severely restricted when they swim and not particularly hardy. A mass market of Tosakin may well bring the price down and increase availability, though, as with other forms of fancy goldfish, a poor quality version doesn’t do anyone any good. Turn up at a UK goldfish show and have a look at some first, then think long and hard about whether you want to take on this type of fancy goldfish with all the trials and tribulations that comes with it. Fish farms in South-East Asia are all about breeding something different to everyone else. The hope is that it will become the next big thing on the world stage. Commercial treatment of Tosakin is no different, with breeders in Bangkok and Indonesia already producing calico Tosakin, telescope-eye Tosakin, dragon-eye Tosakin and Orandas with Tosakin tails. Just watch this space! Andrew Barton is president of the AMGK, GSGB member, and chairman of the Nationwide Standards Committee. He has been keeping goldfish for 30 years and has two of his own strains of Fantail, maintains a 60-year-old strain of Bristol shubunkins and has his own strain of veiltail Orandas, Ranchu and Lionheads. Some say that the body and finnage of the Tosakin are the same as for a Fantail, apart from the tail? They’re similar but wouldn’t be identical and mine aren’t the same shape from the side. The body should be teardrop shaped and the head should be very pointy, particularly with a high nose position and flat dorsal profile. Some say to feed Tubifex and keep the fish in warm water to create the pointed head, yet when offered Tubifex mine wouldn’t eat it. As chairman of the nationwide standards do you intend to create a British standard for Tosakin? Stan Woolridge’s intentions and mine are to up the number of Tosakin kept in the UK and to get people interested. I’ve got some information from some Japanese websites via a translator and we’re now working on a British standard. Internet sources quote the importance of algae. What are your thoughts? Green water helps to develop the colour of the fish though I wouldn’t have long, stringy algae in a Tosakin tank. Geert Coppens is Europe’s most famous Ranchu keeper. He used to import and keep Tosakin too. Many UK sources say that Tosakin are the rarest variety of goldfish in the world. How rare are they in their Japanese homeland? In Japan Tosakin is not a rare variety. Ranchu is the most popular one in Japan, but neverthelesss Tosakin can be bought quite readily from aquatic shops and there are several Tosakin-only goldfish clubs. We’ve heard it said that if you don’t have the space to culture Ranchu, culture Tosakin instead. Would you agree? It’s true that you need less space for Tosakin, and the Tosai (the fish in their first year) should be kept first in bowls before moving on to rectangular tanks in their second and third years. Are genuine Tosakin bowls available outside of Japan? I haven’t seen them. To keep my Tosakin I found similar bowls in a garden centre and drilled them at the bottom so that I could easily change the water. Have you ever seen a calico Tosakin and why don’t you keep them any more? Yes I have seen calico fish, but they are not of the quality of the original red and white fish. I like to look at pictures of Tosakin but I don’t like the way they swim. They are not graceful swimmers,like Ranchu. Could Tosakin ever make good aquarium fish for fancy goldfish keepers? Japanese goldfish are bred to be viewed in ponds and from above. Because of this keeping them in glass aquariums, as is the modern European way, is a waste of time. 1603-1868: Bred in late Edo period. 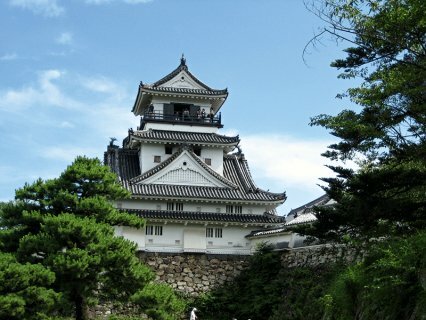 Early 1800s: A low-ranking Samurai warrior breeds them at Kochi Castle. 1845: Original Tosakin bred here, document and first painting of a Tosakin. 1856: Tosakin become established by the Suga family. 1929: Document from fish fair listing Tosakin categories. April 7, 1945: Kochi Air raid, World War Two. December 21, 1945: Earthquake resulting in Tsunami. Six Tosakin left. 1969: Designated natural monument in Kochi Prefecture. 1971: Juvenile Tosakin go on sale in Tokyo. 2006: PFK visit and photograph Tosakin at Andrew James’ house. 2008: Star Fisheries import Tosakin. Stan Woolridge buys some. March 2009: Andrew breeds Tosakin. June 25, 2010: PFK staff visit Andrew Barton. June 26, 2010: Tosakin display at AMGK.